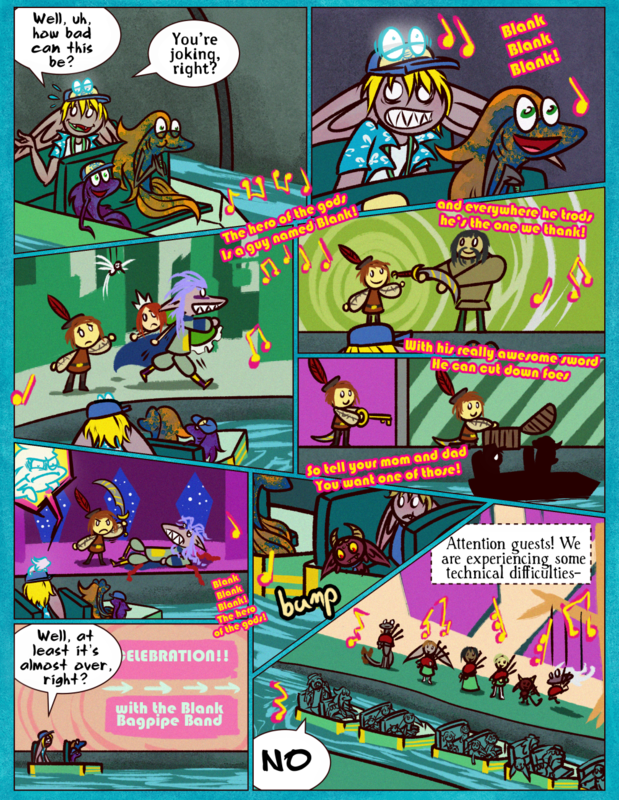 Fun fact, Victor kind of let me do whatever with this page… and I based the ending off of my experience at Disney World this past winter, when my family went on Small World to escape the torrential rain; there were so many people doing just that, that the boats got backed up and we got stuck next to the discordant bagpipe guy. I’ve been looking forward to drawing this page for a long time. It’s one of my favorites so far. I was going to be tiny!Skarvs but I love this tiny!Blank. And if Floyd’s having a rough time with the noise, what about Slice? If I remember from back when they were trying to find Cyril, doesn’t he hear with his entire body…? ALSO I SOMEONE IN ONE OF THE FRONT BOATS GETTING SICK? OR JUST LEANING OVER? It could be that it’s not the effect of sound waves that killing Ecta and Floyd, but rather how un-creative and repetive the music is. Maybe they got high standards? OR MAYBE Skarva hates Blank so much and didn’t want any traitors so he castes a spell on all his minions that they will go increasing irritated at the mention of Blank. But he stopped casting the spell before Slice arrived since he often has to mention the word “Blank” in meetings and when Derk is filling out forms with minions. I think I would be nauseated too if I was on a boat ride listing to the same dull music over and over. Wait, what?! Slice hears with his entire body?? Fish still have little ears, they’re just internal. Bastion is right – er, well not about the anti-Blank spell theory. They’re just reacting to the really corny and repetitive song, but Slice likes it. Nah, she’s just leaning over to play with the water because she’s a little kid! That’s an intense grimace you have on your face there, Floyd. That song must really be out of tune. The horror of being trapped on It’s a small world, or it’s Blank themed counterpart, I look forward to what happens next. At least Cyril doesn’t play one of those. It would be mighty hard to sing while doing so. I attempted to sing the song of Blank, now it’s stuck in my head. WHAT HAVE YOU DONE TO ME!? with his very own hands! and he doesn’t have any… lice? So there is nothing he… uh… can’t.. so…. BUY ALL OF OUR MERCHANDISE! After spending several days playing The Witcher, I had a very uncomfortable mental image upon reading the word plough. I now feel compelled to write fanfiction. The guy in your icon would be proud of you for this. Although your artistic skill has greatly improved, this face will forever stay a classic. So I have no intent on changing it… ever. Old Cyril is watching you. Ok, that was funny. I can picture Slice singing that song non-stop back at Castle Skarva.